Ballard Power is placing a bigger focus on China, evidenced by the various agreements with Chinese companies from the field of bus manufacturing and the development of hydrogen-driven rail vehicles. According to company information, the Canadian fuel-cell manufacturer paid special attention to only collaborate with known, reputable partners, whether big or small, which enjoy their own location advantages. Ballard follows a classic multi-partner strategy approach. It seems as if the company intends to use the scaling effects resulting from the production in China to massively expand the number of fuel-cell stacks in production, but particularly to have the edge in pricing. The latter will of course impact world markets as well, should Ballard be able to offer fuel-cell stacks with the help of Chinese partners. Why, is the question, should the Dutch Ballard partner Van Hool not receive its Ballard stacks from China? In concrete terms, the Canadian company has initiated a project in collaboration with the Foshan Yunfu Eco Environmental Protection Industries International Cooperation Zone, during which hydrogen-driven buses are planned to be manufactured in Guangdong province. The first fuel-cell bus was presented on Dec. 1, 2015, at a special ceremony on-site: It can carry up to 78 passengers, requires a mere 7 kg of H2 per 100 km (a new record! 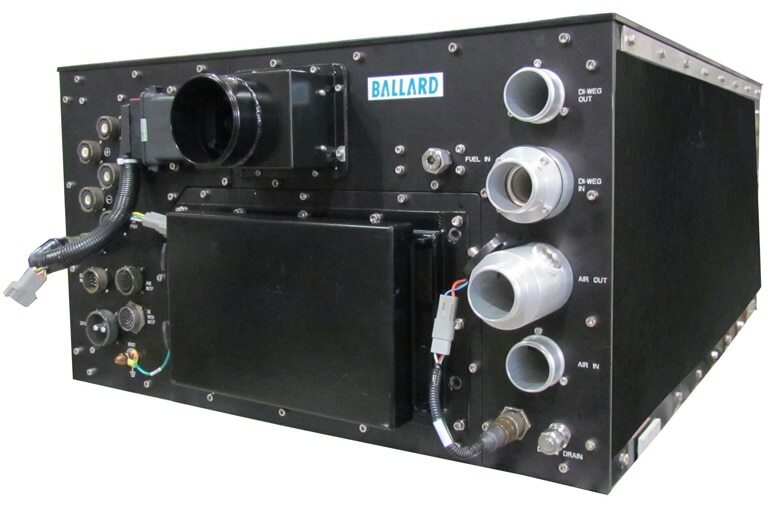 ), has a range of 300 km and contains the most recent fuel-cell module by Ballard: the FCvelocity®-HD7 stack. The first step of the plan is to produce 12,000 fuel-cell modules from mid-2016 on and 3,000 fuel-cell buses per year, which could mean that a large chunk of the modules will go to different customers / suppliers / manufacturers. At the same time, Ballard concluded another agreement: Fuel-cell buses are also planned to be newly designed and built in collaboration with Xiamen King Long United Automotive Industry, the second biggest bus manufacturer in the world. The all-important question is going to be which new and, particularly, which continued and sustainable earnings (licenses, turnover commissions, research projects, stack shipments, etc.) the North American stack producer will be able to generate from the deal. The production and parts manufacturing in China may also provide Ballard with sizable cost advantages in the face of the company’s international competition. The R&D department and the manufacturing of extremely sensitive equipment, however, will most certainly remain with the Canadian headquarters. Additionally, there is the present order of 300 fuel-cell bus modules Ballard was able to secure – the largest individual order in this segment so far. Furthermore, Ballard announced that it had been collaborating with its long-time partner and supplier, the Japanese Nisshinbo Group (over 22,000 employees) to make PEM cells possibly from other materials than platinum or to reduce the share of this expensive catalyst material in favor of high-performance and highly conductive materials, which are less expensive in procurement and production. Here, Ballard has additional research partnerships with different universities and companies besides the aforementioned collaboration. It is safe to assume that Ballard as the global leader in PEM fuel cells will be able to keep and expand its lead. As a sign of the intense collaboration, Nisshinbo also invested US$ 5 million in Ballard or bought shares at US$ 1.50 each from its partner. A strong and enduring research partnership, as it seems to me. In the third quarter, Ballard was furthermore able to finalize the takeover of Protonex. The conditions remained the same, as the majority of Protonex shareholders had already made an early decision in favor of the incorporation. This was one point of initial uncertainty because the price drop of the Ballard shares should have led to the issue of a much higher number of shares than what was provided, in order to correspond to the purchase price. Protonex is expected to contribute already US$ 5 million to Ballard’s turnover in the current fiscal year (12/31/2015). In 2016, the number is expected to grow to US$ 15 million. Meanwhile, Ballard customer Plug Power seems to have made considerable progress regarding its in-house production of fuel-cell stacks for forklift trucks. A concern often mentioned on the discussion boards is that Ballard could completely be off the table as a supplier in the long run. I view this as much less of an issue. My expectation is rather that Ballard will supply fuel-cell stacks for, among other things, forklift trucks of other manufacturers besides Plug. There is already a partnership with M-Field in South Korea. Additionally, I believe that Plug will produce certain stacks for big trucks on its own, but still buy stacks from Ballard for smaller versions in sizes Plug does not even want to produce in-house. Thus, my assessment of the situation is that both companies will continue their good collaboration beyond the contract’s end in 2017. And even if Plug no longer requests Ballard’s services as a supplier at this future point, Ballard should already have targeted much bigger markets by then and be able to offset the losses. The disaster around manipulated emission values from VW does have one beneficiary: Ballard Power. The company based in Burnaby did sell a patent portfolio to VW, but still works for the Wolfsburg corporation through a multi-year contract (up to 2019 – optionally, up to 2021, CAN$ 20 million per year), for example, by developing fuel-cell prototypes. After the Audi h-tron, the Passat and the Golf, it will only be a matter of time until other VW models receive a fuel cell, e.g., in order to create a hybrid version. Why not even a Porsche, since they have already had plans for a so-called Tesla Fighter in form of a battery-driven car, or a small truck, etc. In my view, this is an issue of tax-related year-end sales, meaning one wants turn losses on the books into real ones, in order to claim them for taxation purposes. Such a scenario requires the sale and subsequent re-purchase of shares. Former shareholders of Protonex, who received Ballard shares as compensation for their participation in the deal and who had to suffer from high losses on the books, may be inclined to temporarily part with their Ballard shares. In my opinion, it is the most logical reason for the price drop, since Ballard has been able to deliver a bunch of good news that will have a positive impact on 2016. Conclusion: Ballard enters the new year with high order volume and will be able to increase its capital (with currently around US$ 55 million in the bank) by another US$ 9 million (first quarter of 2016 = final payment by VW). The already existing orders for bus stacks in China will be complemented in 2016 by orders from Europe and the US. Plus: The launch of the large-scale production of bus stacks and modules in China will redefine and greatly increase Ballard’s revenue sources as well as keep them stable in the long run. Ballard subsidiary Protonex is trusted to acquire larger orders from the US military, especially because the US Army has meanwhile fully acknowledged the benefits of fuel cells and hydrogen (e.g., cooperation with GM for prototypes). Additional strategic acquisitions are certain to be realized, whereas the threshold is a minimum 30% gross profit margin and turnover of US$ 15 million per year.